Running calorie calculator - how does it work? How many calories does running burn? How many calories did I burn running? 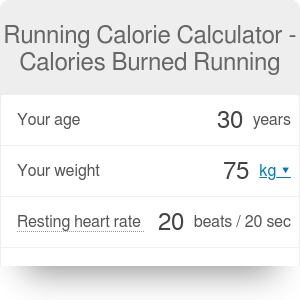 Running Calorie Calculator gives you a straight answer to a bothering question "How many calories did I burn running?" We prepared this tool for all runners who want to count their energetic effort while training. After entering a few basic informations, you get the number of calories that your organism utilized thanks to running. Moreover, the running calorie can tell you about calories burned on treadmill run. The article below brings you closer to some topics like how many calories does running burn, running for weight loss, calories burned on a treadmill, and how to use our calculator correctly. Fitness level is used for calculations because there is a known negative correlation between V02 max and energy cost of running. The relationship shows that with higher fitness level or V02 max, the number of calories needed to run a given distance is lower. Surface gradient level - we burn more calories running uphill (higher inclination -> more calories burned) and we burn fewer calories running downhill (more declination -> less calories) - only up to -10% declination, because beyond this level, the effect is similar to the increasing inclination. On treadmill? Running on a treadmill costs you less energy, because a runner doesn't need to overcome air resistance. Our running calorie calculator provides estimates for net calories burned. Net calories are the number of calories burned, excluding the number of calories that the organism needs to use for staying alive (food digestion, supporting the functions of vital organs, etc.). People often choose running as means to lose weight, and it's hardly surprising. American Council on Exercise prepared a report by which, running burns more calories than swimming, dancing, cycling, and other activities. The rate of calorie burn can vary a lot depending on some variables. The most influential are your weight and the exertion level. Also, the surface grade matters (whether you are running uphill or downhill). Lots of publications and most of the running experts suggest that a person of average weight burns around 100 calories when running a mile. That value increases slightly if you weigh more or if you're running in a less efficient way. Both conditions result in more burned calories while covering the same distance. On the other hand, what is interesting, the number of calories doesn't go up if you run faster. Why? Because running efficiency improves with speed and we calculate calories burned per distance rather than time. Most people don't really know how far they need to run to burn a set amount of calories. In reality, there is no straight answer to that problem. Taking into account that the amount of burned calories doesn't grow with run speed is good news. It means that you don't have to worry about speed when it comes to calorie burn. You can burn the same amount of calories by running for a longer time period if you want to run at a slower pace. When exercising, your organism has to consume energy. This energy is supplied in the form of calories. 1 pound is equivalent to 3500 calories. So, if your goal is to lose 1 pound of weight per week, you will need to burn around 500-1000 more calories than you take in every day. It is essential to keep a healthy diet plan and maintain a proper daily calorie balance. Remember that an extra doughnut eaten after lunch can easily undo those calories you have burned during a morning run. While running through any terrain, what you need to struggle with is the air resistance (similar to riding a bike). While using the treadmill in a gym, your body doesn't physically move forward, so there is no air resistance at all. That's why running on a treadmill costs you less calories. If you're running at a casual speed of 9 km/h (5.6 mph), the energy cost of air resistance while running on solid ground is approximately 0.84 calories per kilometer (assumes no extra wind to overcome). That is about 1.2% more calories burned in comparison to a treadmill run. Let's check on example data how to use the calculator correctly. Running Calorie Calculator - Calories Burned Running can be embedded on your website to enrich the content you wrote and make it easier for your visitors to understand your message.